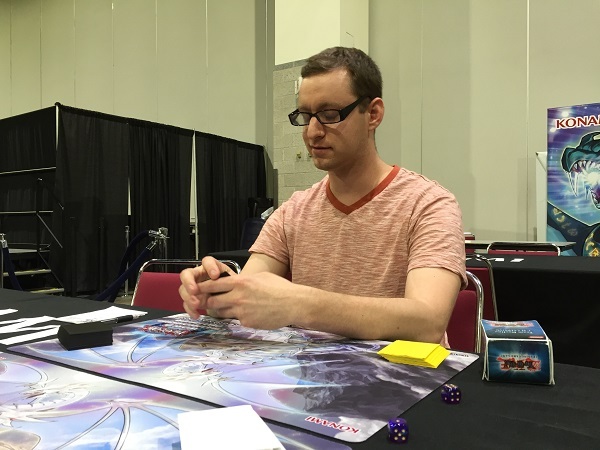 Michael Egna is from Albany NY and is running Odd-Eyes Magicians. Steven Gleason is from New Jersey and is also running Odd-Eyes Magicians. Both have 15 points and a win here would guarantee a Day 2 appearance. Which one of these Duelists will ensure their appearance tomorrow? Let’s find out! Egna won the roll and elected to go first. Egna started off with Majespecter Raccoon – Bunbuku, Odd-Eyes Pendulum Dragon, Mist Valley Apex Avian, Nobledragon Magician and Archfiend Eccentric. He Normal Summoned Raccoon and added Majespecter Unicorn – Majespecter Unicorn – Kirin from Deck to hand. He activated Odd-Eyes Pendulum Dragon and Archfiend Eccentric in the Pendulum Zones and Pendulum Summoned Kirin in Defense Position. In the End Phase, Odd-Eyes Pendulum Dragon used its Pendulum Effect to destroy itself to add Performapal Monkeyboard from Deck to hand. Gleason Normal Summoned Performapal Skullcrobat Joker, adding Performapal Monkeyboard from Deck to hand. Monkeyboard was activated and searched out Performapal Odd-Eyes Unicorn. Sky Iris was next, destroying Performapal Skullcrobat Joker to search for Odd-Eyes Fusion. Archfiend Eccentric was activated and destroyed the opponent’s Eccentric. Odd-Eyes Fusion came down next, sending a copy of Odd-Eyes Vortex Dragon and an Odd-Eyes Rebellion Dragon. Next, Gleason Pendulum Summoned 4 monsters! Luster Pendulum, the Dracoslayer, Performapal Pendulum Sorcerer, Performapal Skullcrobat Joker and Archfiend Eccentric! Performapal Pendulum Sorcerer’s effect activated, targeting the scales, Egna chained Kirin, bouncing itself and Odd-Eyes Vortex Dragon away. Gleason continued by activating Performapal Guitartle. Luster Pendulum, the Dracoslayer and Performapal Pendulum Sorcerer were tuned to Synchro Summon Ignister Prominence, the Blasting Dracoslayer which in turn Special Summoned Master Pendulum, the Dracoslayer from the Deck. Performapal Lizardraw was activated and destroyed to draw a card. Guiding Ariadne was activated but was swiftly destroyed by Ignister to spin away Raccoon. Ariadne’s effect revealed 2 copies of Solemn Scolding and Solemn Warning. Egna selected Warning to add to hand, and the Scoldings were shuffled back into the Deck. Performapal Skullcrobat Joker and Master Pendulum, the Dracoslayer were used to Xyz Summon Majester Paladin, the Ascending Dracoslayer and its effect was used to Special Summon Luster Pendulum, the Dracoslayer. Next, Gleason Tributed Luster and Eccentric for Dinoster Power, the Mighty Dracoslayer whose effect was used to Summon Master Pendulum, the Dracoslayer from the Graveyard! With all of those monsters, Gleason attacked with all of his monsters to wipe out Egna in a single Battle Phase! Egna elected to go first and opened up with Odd-Eyes Pendulum Dragon, Terraforming, Sky Iris, Igknight Reload and Mystical Space Typhoon. 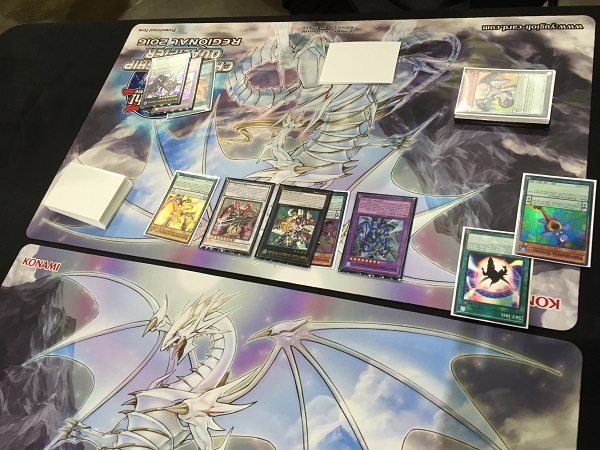 Sky Iris and Odd-Eyes Pendulum Dragon were activated, with Sky Iris trading one Odd-Eyes Pendulum Dragon for another. Terraforming came down, searching for Secret Village of the Spellcasters! 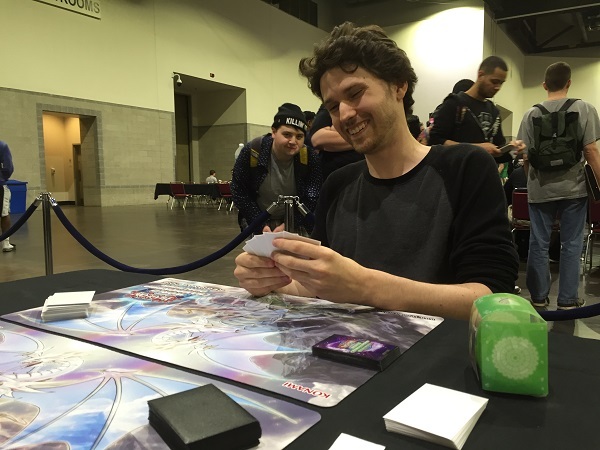 Igknight Reload shuffled Odd-Eyes Pendulum Dragon back into the deck to draw Sky Iris and Pendulum Call. Pendulum Call was activated, discarding Sky Iris and searching for Wisdom-Eye Magician and Dragonpit Magician. 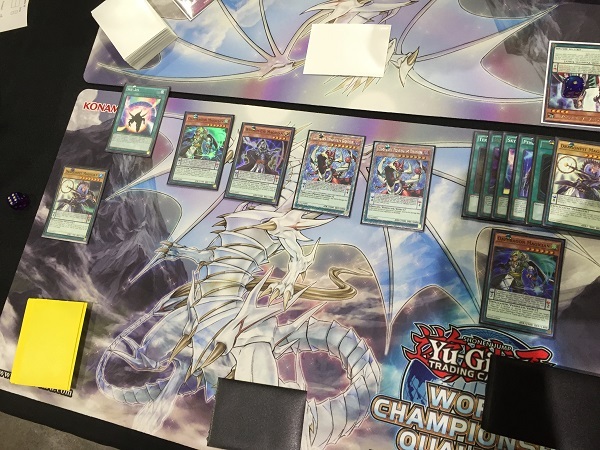 Both were placed in the Pendulum Zones and Odd-Eyes Pendulum Dragon was Pendulum Summoned from the Extra Deck! He set Mystical Space Typhoon and passed. Gleason activated Performapal Monkeyboard but it was blasted away by Mystical Space Typhoon. He followed-up with Magical Abductor in the Pendulum Zone (Gleason received a Slow play Warning for taking too long to consider his options after Monkeyboard was destroyed), followed by a set monster and a set Spell/Trap. Egna activated Wisdom-Eye Magician, destroying it and putting Oafdragon Magician in its place. Oafdragon Magician used its effect to add Wisdom-Eye Magician from the Extra Deck back to the hand. 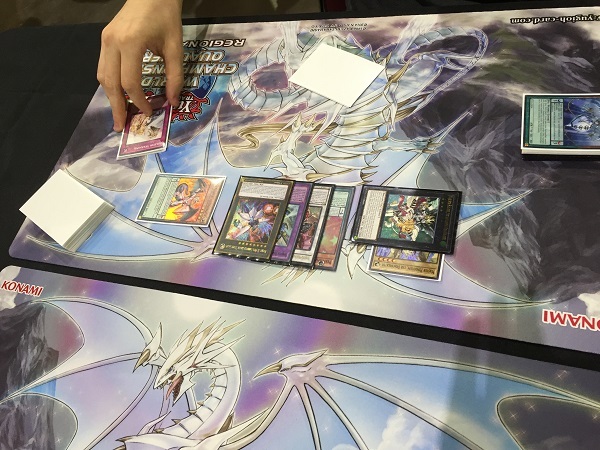 Sky Iris then destroyed the Oafdragon Magician and searched for Odd-Eyes Pendulum Dragon. Wisdom-Eye Magician was placed in the Pendulum Zone where its effect was used again to destroy it for another Oafdragon Magician from the Deck. Dragonpit Magician’s effect was used, sending another Dragonpit Magician to destroy the set Solemn Strike. Egna then Pendulum Summoned 4 monsters: 2 Odd-Eyes Pendulum Dragon’s, an Oafdragon Magician and Wisdom-Eye Magician which was enough to earn the concession from Gleason! We’re swiftly moving on to game 3! Gleason elected to go first. He activated Magical Abductor, then activated Painful Decision, sending Master Pendulum, the Dracoslayer to add Master Pendulum, the Dracoslayer. Master Pendulum, the Dracoslayer was activated in the other Pendulum Zone whose effect was used to destroy itself. Lector Pendulum the Dracoverlord followed-up in the Pendulum Zone. Next, 3 counters were removed from Magical Abductor to add Luster Pendulum, the Dracoslayer from Deck to hand. Four monsters were Pendulum Summoned; Luster Pendulum, the Dracoslayer, Master Pendulum, the Dracoslayer, Performapal Pendulum Sorcerer, and Guiding Ariadne. Performapal Pendulum Sorcerer destroyed the scales and added Performapal Skullcrobat Joker and Performapal Guitartle. Performapal Skullcrobat Joker was Normal Summoned, searching for Performapal Lizardraw. Luster Pendulum, the Dracoslayer and Sorcerer were tuned to Synchro Summon Ignister Prominence, the Blasting Dracoslayer whose effect Special Summoned Master Pendulum, the Dracoslayer from the Deck. Performapal Guitartle and Performapal Lizardraw came down next and their effects were combined to draw 2 cards. Performapal Skullcrobat Joker and Master Pendulum, the Dracoslayer were Tributed to Special Summon Dinoster Power, the Mighty Dracoslayer whose effect Special Summoned a Master Pendulum, the Dracoslayer from the Graveyard (sent from Painful Decision). The 2 Masters were overlaid for Majester Paladin, the Ascending Dracoslayer and its effect was used to Special Summon Luster Pendulum, the Dracoslayer from the Extra Deck. Then, Ignister was used to destroy Guiding Ariadne and spin Performapal Guitartle back to the deck. Guiding Ariadne’s effect was activated, revealing 2 Solemn Scoldings and a Solemn Strike, with Solemn Strike being selected. The 2 Dracoslayers were overlaid for Number 38: Hope Harbinger Dragon Titanic Galaxy. Egna started his turn with Performapal Skullcrobat Joker, two Dragonpit Magicians, Performapal Monkeyboard, Mystical Space Typhoon and Archfiend Eccentric. He activated Performapal Monkeyboard (and received a Slow Play Warning) and Gleason negated it with Number 38, attaching Performapal Monkeyboard as an Xyz Material. Archfiend Eccentric came down and its effect blasted itself and the face-down Solemn Strike. Performapal Skullcrobat Joker was Normal Summoned but its Summon was negated with Solemn Warning, and that was enough for the handshake! Gleason moved on with a 6-1 record!